The award-winning Chichester Farmers' Market is the perfect place to pick up tasty treats for a summer barbecue. The market boasts a diverse mix of stalls with a variety of products on offer including: fruit and vegetables, eggs, cheese, meat, seafood, baked goods, gin, and more. All produce is where possible grown, sourced and produced within the District, making it fresh and tasty. 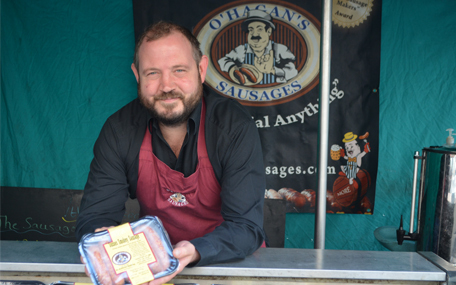 Sausages are a barbecue staple and shoppers can pick up different varieties at O'Hagan's stall. O'Hagan's is a family run business making handcrafted sausages using high quality ingredients. Their seasonings are the family's own recipes and have been passed down through the generations. Shoppers can browse other meats including chops and steak for the barbecue at Rother Valley Organics' stall. Rother Valley Organics is a family business run by two brothers in the South Downs. The meat they sell is fully traceable which ensures that it is of the highest standard. A fresh salad makes a great side dish for a barbecue. Glasshouse Salads is based just outside of Chichester and sells a variety of lettuce, cucumbers, peppers, potatoes and oriental vegetables at the market. A local gin is the perfect drink for a summer evening. Customers can browse a range of gins from Jarrold's Gin. All of their gin is distilled in Chichester and their Sloe gin is made using local Sloe berries. "When the sun is shining, the Chichester Farmers' Market is a great place to browse a variety of products and sample the best of what the area has to offer," says Councillor John Connor, Cabinet Member for Environment Services at Chichester District Council. "I would encourage residents and visitors alike to visit the farmers' market this summer for all their barbecue essentials." Earlier this year, Chichester Farmers' Market won the coveted Farmers' Market of the Year award at the Sussex Food and Drink Awards 2018. The award recognises the hard work and high quality of all the stallholders. "We are incredibly proud to have won this award and to have been recognised as the premier farmers' market in Sussex," adds Cllr John Connor. "Our stallholders work extremely hard throughout the year to ensure a wonderful range of top quality produce is available for our loyal customers who visit the market every fortnight. Chichester Farmers' Market takes place on the first and third Friday of the month from 9am until 2pm in North Street and East Street. People can also follow Chichester Farmers' Market on Facebook and Twitter .